Tired of losing your favourite TV series episode? Let your phone tell you when they are coming! !!! Now with Wide Live Tiles for Windows Phone 7.8 and WP8 !!! Build with a minimalist and direct to the point interface the Series Notifier provides to you information from the enormous database of Series with thousand of indexed series. !!! WATCH EPISODE'S PROMOTIONAL CLIPS DIRECT FROM YOUR PHONE !!! You can search for series, add them as favourites and from that point and after the app will notify you when a new episode is coming live. You can also use it to keep a schedule of episodes that you have watched in a simple list form. Social tools will also provide ways to share series and episodes, as well as get the best suggestions to you using a smart algorithm that learns what you like. Follow Animes, TV Series, TV Shows, Cartoons, any kind of series that has episodes you can find here! You can also add and improve information at http://www.thetvdb.com!!! This app is in BETA, not all functionalities are ready yet. Please send your comments to contact@nakedmonkeygames.net and we will be updating it to the best app for YOU! - set custom timers for your notifications! Fix for Crashes, and Bugs. Shortcut for Teasers into Next Ep. List. Toggle the automatic update from within the app! Added Wide Live Tiles with amazing arts to let your WP7.8 more awesome! Mark all episodes of a season as watched!!! 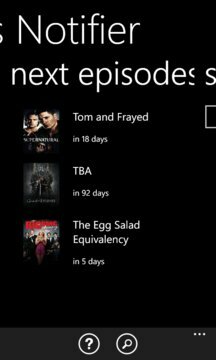 Swipe to navigate between episodes!!! Watch Video Promotional of each episode!!! Share in any Social Network you are registered!! !